Nancy Sanchez, 19, from Texas, born in Mexico. When I got TheDream.US scholarship, my mother cried and my sisters jumped around the house excitedly. I was silent for the moment, thinking back to the nights of my father working, running on little sleep, and my mother’s fear compounded by financial woes. It was not only my dream come true, it was their dream come true. I came to the United States when I just one year old. My dad worked two shifts per day, six days a week, while my mother and I stayed home in an unfamiliar place with an unfamiliar language. But my parents always reminded me why we were here: so that I could have opportunities that they were never afforded, and maybe one day graduate college. I am the only undocumented child in my family. The reality of this sits like a stone in my stomach. A burden that, for a while, I had to bear alone and could not share with any of my siblings. My third-grade teacher, Mrs. Gomez, played a pivotal role in my assimilation to the United States. She was patient as my lips learned the words and phonetics of the English language. With her, I didn’t feel like an outsider or afraid because of my status. In high school, I immersed myself in extracurricular activities and did well in my classes. But, with little financial assistance and without a proper immigration status, college still seemed like a distant goal. That’s why my scholarship and the chance for a college education mean so much. I am currently a sophomore at the University of Texas at El Paso (UTEP), studying marketing. I am part of the Women in Business Association (WBA) and was part of the American Marketing Association (AMA), and I volunteered for the Susan G. Komen walk for breast cancer. I would love to combine my marketing education with my passion for geology to aid our planet’s well-being and push people to become more reliant on renewable energy. 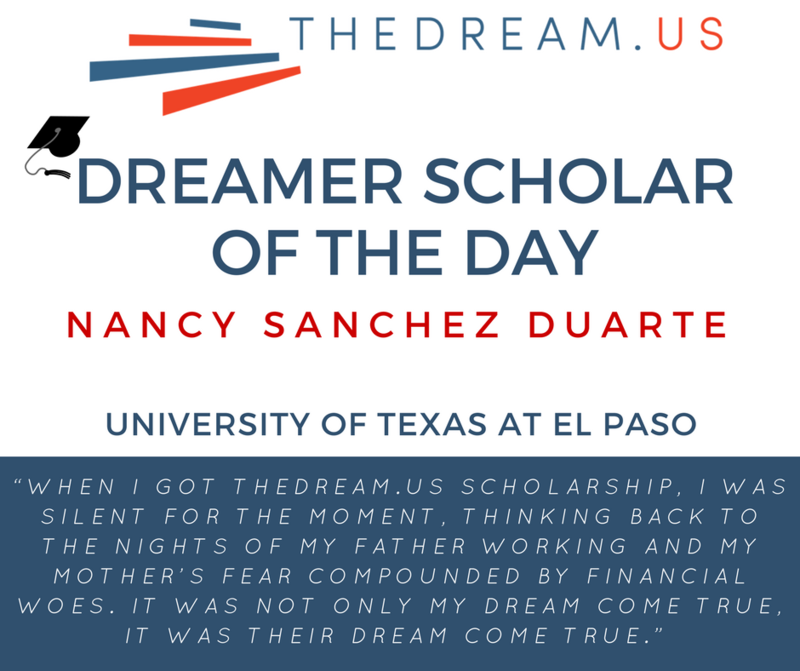 One day, I would love to start a scholarship foundation to give more undocumented students the chance to pursue their dreams and get a college degree. I believe that we should all be given the opportunity to further our education, regardless of immigration status. My message to DREAMers is to never ever give up. Whenever you feel like things aren’t going your way, remember that from our darkest days we learn valuable lessons, and those lessons are the key for a brighter day. No dream is too big for us and with perseverance, anything is possible.